where there is sharp kerb, all the more awkward for cyclists laden with shopping, and (ii) the danger presented by delivery lorries turning round the back of Homebase into the path of west-bound cyclists. 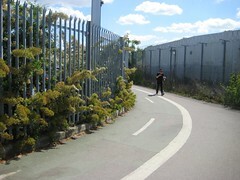 The route then continues along a short stretch of shared use path (middle photo) with not very great lines of sight, also encroaching vegetation, then onto Blackburn Road (bottom photo), which is often congested with resting minicabs. There is due to be a new student housing development on Blackburn Road; we hope that some thought will be given to improving conditions in the area for cyclists (and pedestrians) at the planning stage. 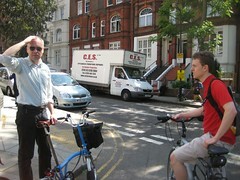 Then onto West End Lane, where we discussed the lack of cycle parking, made worse by the recent removal of ‘street clutter’. CCC has previously pressed the Council to rectify this; clearly we need to have a further push. The quartet proceeded south and east, into South Hampstead proper, where we looked at what could be done for cyclists on Compayne Gardens, Canfield Gardens and Fairhazel Gardens, reviewing proposals detailed here [photo on the right: feeling the warmth at Compayne/Canfield]. 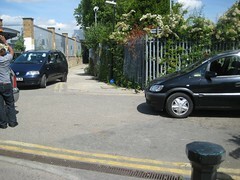 Then off south and west, along Boundary Road towards the bottom of the Kilburn High Road. 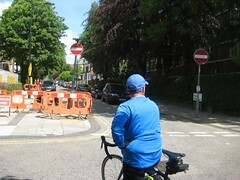 On Kilburn Priory we examined the curious arrangement on the bridge, where cyclists can ride northbound contraflow, alongside parking bays. 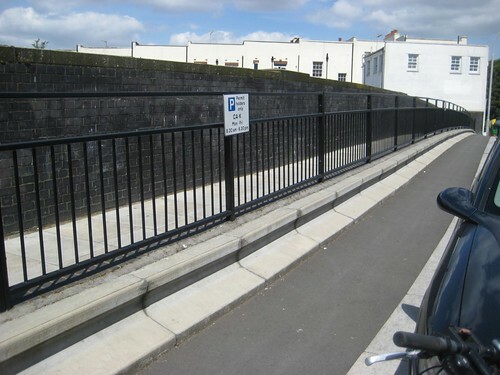 Some years ago, the Council put in railings along here, but oddly, on the west side, between the pathway and the exit area for the motorists [photo on the left]. 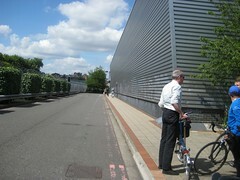 This looks like it might have been intended to be the path for contraflow cycling? If so, the parking bays should be moved to the other side! Back down West End Lane and into Quex Road , then down Mutrix Road, where facing the junction with Birchington Road we looked at a possible cut through an estate (long ago suggested by David Arditti). Then down south through an existing cut-through, past Hermit Place, right onto Belsize Road then left onto Kilburn High Road and left again into Springfield Lane (one-way at the top end leading away from the High Road), where we asked years ago for contraflow cycling and signal changes to facilitate the parallel route to the A5. And finally – pub lunch, at the Clifton – enjoyed by all!